Unless someone’s an expert in this department, choosing a sewing machine thread is not exactly an easy thing to do. In fact, it can be a bit more complicated than just stepping inside the crafts store and picking any available threads. You want to make sure that the sewing thread you’ve bought is just right for the fabric or applicable for a certain type of sewing. 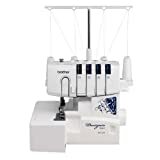 You may have well known that the best sewing machines or top rated sewing machines deserve the best quality threads. You want a sewing thread that is strong, smooth and does not fray or tangle easily. You also want a sewing thread that is uniform in thickness and color. Remember that a good sewing thread is the essential to a smooth and successful sewing job. Your choice of thread will depend on the type of sewing you’re going to tackle. Are you going to do fabric repairs such as mending rips or holes? Or are you going to do simple patterns for your dresses or aprons? Or you have chosen to do some more intricate embroidery work? Doing fabric repairs or hems requires a more common and straigthforward type of thread, especially on a light- or medium-weight fabric. A decorative type of sewing like embroidery may involve several techniques depending on your preference like cross stitch, satin stitch, seed stitch, feather stitch, and so on. Threads for embroidery come in many types. Even a single embroidery project may need threads of many different colors. Cotton thread – the most common type of thread, ideally used for light and medium fabrics. A 100% cotton thread should be highly resistant to heat (even pressing the thread with a hot iron won’t make it burn). However, a cotton thread lacks stretchable properties, so it is highly likely to break especially if it’s used anything other than a pure cotton fabric. Polyester thread – unlike cotton, the polyester thread is a synthetic thread which has a good stretch and can be applied to any kinds of fabric. However, it may scorch easily when exposed to heat. Nylon thread – another synthetic thread, the nylon thread is elastic and can be applied to many sorts of fabrics. But it can easily burn or melt when ironed. Metallic thread – this type of thread is used chiefly for decorative purposes. Even a small amount of this thread can bring a lot of “pop” or “bling” to your dresses. Because metallic threads are different from the other threads, they require a designated needle as well as a bit more different sewing approach. Silk thread – a fine and shimmering thread, it can be used for all types of fabric, but it is mostly ideal for sewing delicate fabrics. Wool thread – it is ideal for embroidery stitching. Designer thread – this type of thread can be a combination of two or more properties, e.g., cotton/silk/rayon. Machine threads – these are types of threads that are specifically made for inserting into sewing machines. They come in two sub-types: Bobbin thread – fine and delicate, this type of thread is used in the bobbin. It is used in most sewing machines, from regular machines to embroidery ones. Variegated thread – also known as a multicolored thread, the variegated thread is usually made of polyester. As the name implies, a single thread can come in two or more colors. It can bring a touch of excitement to your embroidery machine sewing. If you are unable to find a thread color that matches exactly to the color of the fabric, follow this basic rule: choose a color that is a few shades darker than the fabric. This method is good particularly if you’re doing simple repair work or doing seams. If you choose a lighter or brighter thread color, it will “pop out” against the fabric and you don’t want that. But if you’re applying aesthetic methods to your sewing, choose threads of bright or complimentary colors, for added visual effect. The best way to pick the correct or preferred color of the thread is to bring a big swatch of fabric with you when you’re out shopping for threads. Pick up a thread and then compare it to the color of the fabric. This will help you decide which color will look best for the fabric. Those thread discounts look really enticing and may pull you into buying them. But you know all too well that cheaper threads mean low quality threads that can easily break during stitching and won’t likely last long. It’s always better to buy quality threads — they may cost you more, but they ensure a stronger, tidier and more stable stitching. 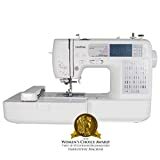 You may check out some sewing machine reviews from professional and amateur sewing experts who can further give you recommendations on the right sewing threads. Happy thread shopping! Computerized Sewing Machines — What’s So Special about Them?